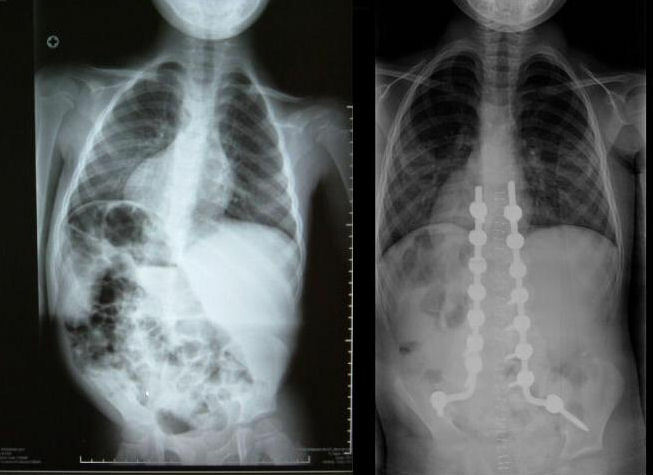 My son was born with congenital scoliosis. He had a hemisacrum (he had the right side of his sacrum along with the middle, the bones on the left side were completely missing), and a hemivertebrae (half a vertebra, literally, it looked like a pebble wedged between the bones above and below it) fused at L5 area. 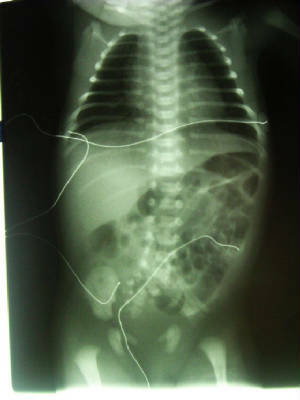 When he was young, his spine appeared straight except at the very bottom. It wasn't until he started standing and walking that a curve started to appear and was visible to the eye at age 18 months. Thankfully, it stayed stable or only slowly changed over the next four years so we really didn't have to do anything other than watch it with xrays every six months. 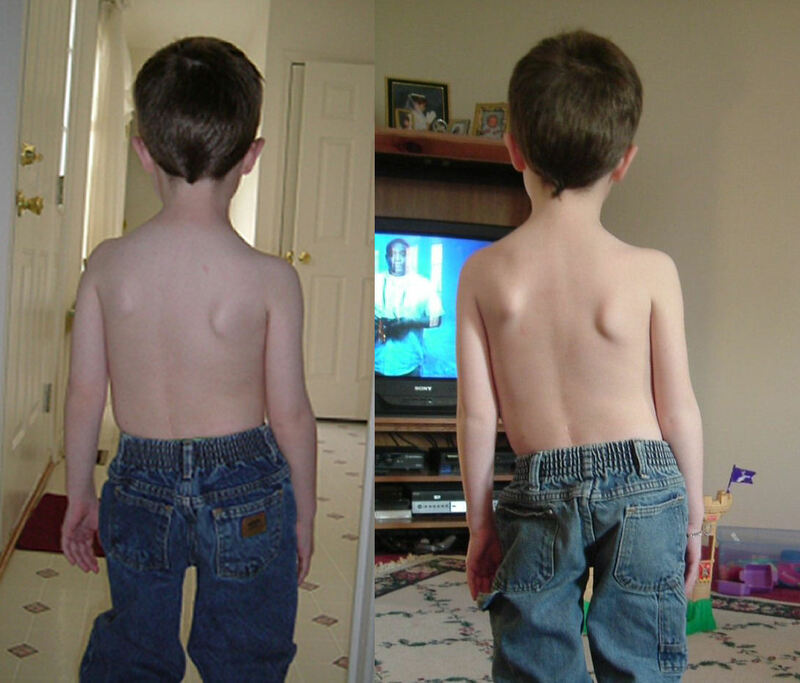 His scoliosis started worsening as after a growth spurt at about age 5 1/2, as the weight of his growing spine was not properly supported down at the base since he is missing half his sacrum. You could see that his shoulders were no longer lined up over his hips. After talking with the ortho doc, we decided that it was better to address this fairly soon so we could do an easier surgery with posterior fusion only. Waiting would have worsened things and required that we go in from the front and fused there also, so despite concerns over loss of trunk height we decided to have the surgery. Luckily, the problems were all in the lumbar area, so it wouldn't affect his growing lungs. He had a lumbosacral fusion with pelvic fixation done in August of that year at age 6. Both sides of the pelvis were attached to the lumbar spine with rods and screws and the whole lumbosacral area had bone grafts to fuse the area solid after straightening the angle in which the spine leaves the pelvic area to balance him out. The doctor ended up having to fuse up higher than he had anticipated (sacrum to T11) since vertebra which had looked normal on the x-rays turned out to be abnormal when he went in to do the surgery. 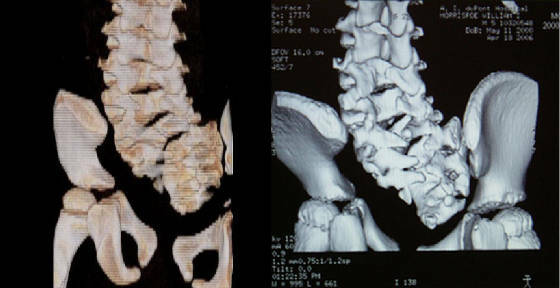 The doctor had to go up to the normal bone area in order to achieve a good result, as leaving the abnormal vertabra above the fused site could have caused a false joint which could potentially cause spinal cord compression. At a year post fusion, my son was doing wonderfully and was released from most of his physical restrictions, except contact sports and hanging from his arms. He regained most of the motion he had initially lost (socks and shoes were a challenge for a while! ), and has had no complications from the surgery. It's now ten years after the fact, everything has fused well and remains stable, so all we do is continue to watch it until he is done growing. There is a slight curve over the fused area, and we found out that one of the rods broke around 2014, but it isn't causing any issues so the doctor isn't worried about it. We keep an eye out for any signs of nerve issues or pain in the area and would need to let the doc know if we saw that. He is now full grown at 16, and we can tell by comparing his arm length (wingspan) to his height that he has lost just about 6" from fusing the spine. We belong to a Facebook support group for congenital (caused by malformed vertebrae) scoliosis, Anyone also dealing with this can join from the link below. You can join us on Facebook! Click here to go to the Congenital Scoliosis Support FB page! Here are xrays from 2011 showing how nice the fusion has held up! No complications from the surgery, although you can see that Billy has what is termed "flat back", which used to be a complication of old fusion instrumentation and Harrington rods. For Billy, though, it's just how his anatomy is formed :( Hopefully it doesn't give him too much back pain as he gets older. 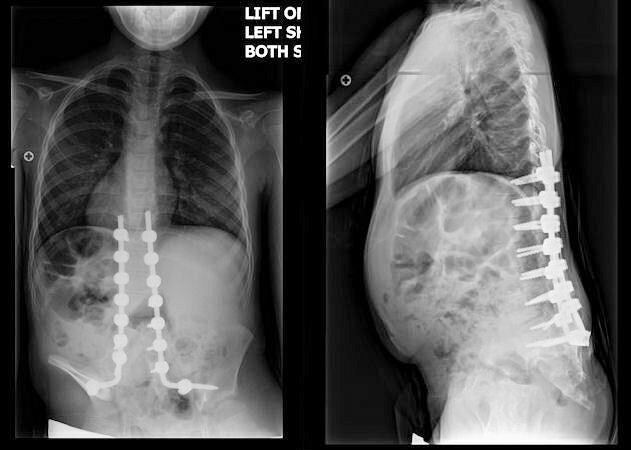 Also, if you compare the fusion xray right out of surgery to the one in 2011, you can see how much the upper spine has grown in the 5 years between xrays, but that the fused area has not. That area will always be the same size/length that it was when it was fused at age 6... not ideal, but one of the costs of fusing early. However, when the anatomy doesn't behave, you have to weigh the risks and benefits and make the best decision you can, and for us, the fusion at 6 was Billy's best option for a stable spine.